I’ve always disliked my kids playing with Playdoh. Hmm… that didn’t quite come out right. Let me start again. 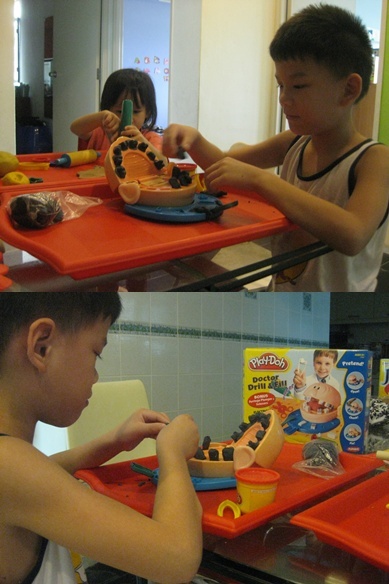 I like Playdoh and I like my kids playing with it (cos it’s really fun). What I dislike is the clean up after. It leaves behind ridiculously-tedious-clean-up messes that’s a tad too stressful for domestically-challenged moms like me. Meshed spots of playdough on the table, on the floor and on the playdoh accessories. Aargh! Yes, I have allowed them to play with it at home before, at times, but those times were highly dependent on me feeling “up-to-it” which suffice to say was rather, rather rare. But my kids (like almost every other kid) love playing playdoh. So their love for it coupled with the unopened boxes of playdoh sets in their cupboard added to my already surmounting heap of motherhood guilt. Everytime they spotted the boxes and requested to play and I said “no,” I could just feel that 1 guilt point adding up. Yet even that couldn’t move me to succumb. That clean-up-after mess was a very real deterrent. The solution? I use two red trays which I bought for SGD3.90 a piece (I think) at IKEA and enforce the rule that all handling of playdough MUST be kept within the tray area. It works wonderfully. The cleaning up after is negligible. I’ve opened ALL playdough collections we’ve acquired and they were such a handy keep-the-kids-occupied tool during the last month-long holidays in June when we were frequently rained in, AND… it has eliminated one of my motherhood-guilt contributors. Sweet, sweet, sweet. Hubby-jr's playing with the dentist set and yes, that's green playdough teeth! As much as I wished it was so, this brilliant idea did not come to me while I was folding laundry, rather it was inspired by this post at one of my favourite websites – Ohdeedoh. Are you inspired too? « Why Do Stay Home Moms Have No Time?